The hit CW Network action series, Supernatural which stars Jared Padalecki and Jensen Ackles as Sam and Dean Winchester and Misha Collins as the angel Castiel, turns 100 episodes old next Thursday April 15th at 9PM EST so I say let the party begin! 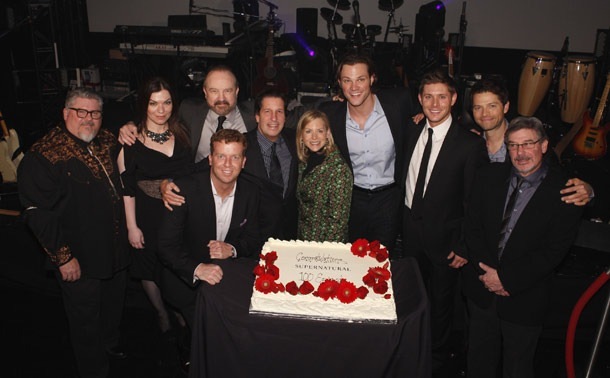 And what better way to start a party than to show the party that the cast and crew had back in January shortly after they finished filming the milestone 100th episode titled Point of No Return. Supernatural has come a long way from it’s season one days on the now defunct WB Network and its subsequent move to the CW Network. Back then fans and viewers were just beginning to take the monster hunting, demon fighting journey with the newly reunited brothers Winchester who were also searching for their missing father, John Winchester (played by Jeffrey Dean Morgan). Along the way, we have watched Sam and Dean grow together and then apart from each other again as tragic events, deals with demons and both holy and unholy destines have unraveled the foundation of everything they thought they knew about themselves as hunters, sons and brothers. Several things have been key to keeping Supernatural going strong for five years and 100 episodes and counting. The most important has been the strength and versatility of talent in the two lead actors, Jared Padalecki and Jensen Ackles. These two young actors are more than just pretty faces on a CW series, they are dedicated to their craft and they care about their characters and their work. Second has been the addition of such well rounded characters as Bobby Singer and the angel Castiel. 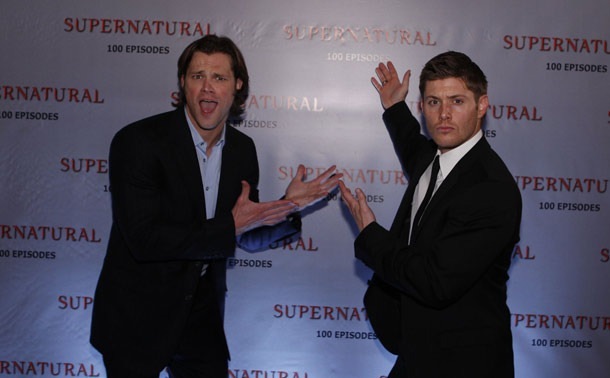 Both Misha Collins and Jim Beaver have only added to the success of Supernatural. Third has been the writing, which kept Supernatural from being just another formulaic ‘monster of the week’ action series and has strived to create and maintain interesting characters, stories and has given viewers plenty of things to think about, talk about and write about. Last but by no means least, as the cast and crew of Supernatural will tell you, the fans and the viewers who tune in every Thursday night to catch up with Sam and Dean Winchester are also a huge part of the success and longevity of the series. So let’s party on and celebrate Supernatural’s milestone 100th episode with some sneak pick vids of S5.18 Point of No Return. A frustrated and exhausted Dean (Jensen Ackles) begins to think the only way to stop Lucifer and save the planet is to say yes to becoming Michael’s vessel, but unbeknownst to him the angels have been coming up with a “Plan B.” Dean, Sam (Jared Padalecki), Castiel (Misha Collins) and Bobby (guest star Jim Beaver) are horrified at the angels’ new idea and take on Zachariah (guest star Kurt Fuller) to prevent the beginning of the end on Earth. Also guest stars Jake Abel as ‘Adam.’ John Showalter directed the episode written by Jeremy Carver. And of course, the party!